Most New Years Resolutions don't get fulfilled. Only about 8% of resolutions are achieved and of those, only 46% last 6 months or more, and the #2 Resolution last year was "getting organized" according to StatisticsBrain.com. Most people fail on this resolution because de-cluttering, organizing and deep cleaning the whole house seems daunting. And because they don't have a practical, sustainable plan to put in place. And, well, because it's time consuming. The key is to break up any big task like a seasonal deep clean into simple, manageable portions according to a plan we can stick with. It's important to have a manageable plan for de-cluttering, organizing and deep cleaning, and then start with some easy tasks that create easy wins and momentum to stick with the plan. 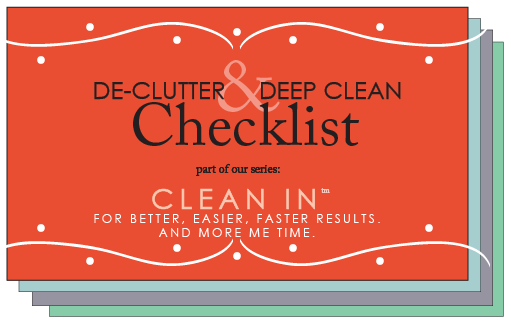 Maid Brigade’s De-Clutter and Deep Clean Checklist is your answer. With de-clutter and deep clean tasks listed by room, your own program for de-cluttering and deep cleaning will be easy to follow. Work the plan at your own pace – all the steps are included to help you stay focused, no matter how fast or slow you work the checklist. Don’t have time to do it all? Join forces with Maid Brigade – we can take care of the deep clean for you! Find your local office by using the Zip Code Locator at the top of this screen.